June 26, 2009 through September 12, 2009 - The New York Public Library for the Performing Arts - Diaghilev's Theater of Marvels: The Ballets Russes and Its Aftermath - very wonderful exhibit. July 26, 2008 - Pacific Harp Institute - Salzedo and Beyond: Celebrating a Great Harpist and His Legacy performs Bolmimerie. 1904 - graduated from Russian Imperial Ballet School in St. Petersburg, Russia. Principal teachers: Karsavin and Legat. 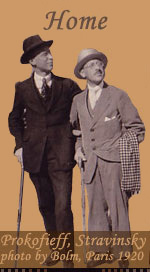 1909 - Bolm organized another European tour with Pavlova as his partner. Danced in Berlin with Pavlowa. Danced in the Empire Theater, London with Lydia Kyasht. Danced in Paris with Diaghilev Ballet. 1909 - Diaghilev brought a troupe of dancers from the Maryinsky Theatre to Paris, including Mathilde Kschessinska, Anna Pavlova, Tamara Karsavina, Ida Rubinstein, Michel Fokine, Vaslav Nijinsky and Bronislava, Adolph Bolm, Michel Mordkin. May 18, 1909 - Borodin, Fokine, Roerich, Bolm, Fedorova, Smirnova. Adolph Bolm and Elena Smirnova danced in Prince Igor at Chatelet Theatre in Paris with Diaghilev Ballets Russes; also presented were Fokine's and Benois' Le Pavillon d'Armide with Nijinsky and Karsavina, and Le Festin. Fokine was there, and says on page 147 of his autobiography, "In spite of the brilliant cast of the first Paris season - Anna Pavlova, Catherine Geltzer, Vera Karalli, Tamara Karsavina, Vaslav Nijinsky, Mikhail Mordkin, Alexandre Volinine - the three dancers who had an exceptionally great success included neither Nijinsky nor any other of the above leading dancers. The greatest success was achieved by the Polovetzian Dances with Adolph Bolm dancing the leading part ..."
1911 - Resigned from Imperial ballet. 1916 - Diaghilev traveled to Lausanne, Switzerland to persuade Adolph Bolm to gather together remaining members of Ballet Russes and direct first U.S. tour. Nijinsky, Fokine and Karsavina were unavailable. In six weeks Bolm was able to assemble the dancers, prepare twenty ballets, and rehearse the troupe so performances were well received in U.S.
1917 - Staged Coqd'Or for Metropolitan Opera in New York with Bolm as King Dodon, Rosina Galli as the Princess. 1917 - Bolm injured during performance on US tour of Diaghilev Ballets Russes, decided to leave tour and stay in U.S.
1922 - Danse Macabre Silent Film starring Adolph Bolm as Youth, Ruth Page as Love, and Owlin Howland as Death, directed by Nick John Matsoukas, accompanied by Sant-Saen's Danse Macabre, Philadelphia Symphony Orchestry with Leopold Stokowski conducting. Conception by Adolph Bolm, Direction Dudley Murphy, Lighting Francis Bruigiere, Animation F.A.A. Dahme, Release Claude H. Macgowan. 1924-1927 - Chicago Allied Arts, first "Ballet Theatre" in the U.S., directed by Adolph Bolm, Eric DeLamarter, Nicholas Remisoff, with John Alden Carpenter and Frederick Stock. Adolph Bolm, ballet master, Ruth Page, premiere danseuse, Thamar Karsavina as guest. 1930 - Bolm in Los Angeles working on The Mad Genius film, John Barrymore, released by Warner Brothers in 1931. Only a few fragments of Bolm's dances were used, and even those were not used in Bolm's musical context, in the film.